You've seen it a thousand times in books and film: A writer rents a remote cabin to get some work done. But soon, strange noises and apparitions penetrate the stillness. Soon, what was meant to be a relaxing and productive retreat in the woods turns into a veritable smörgåsbord of terror. 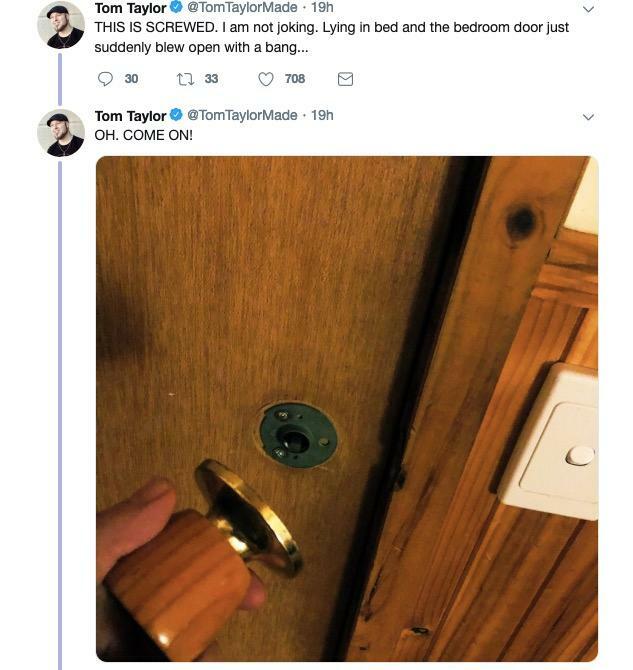 Tom Taylor is live tweeting his own real-life horror movie and though, as of this writing, he's still alive, it's honestly starting to feel increasingly likely this will go the way all "quiet cabin in the woods" stories seem to go. Since he's a published writer, the Australian comic author is aware of how well-trodden this territory is in the horror genre. "I somehow managed to book a creepy log cabin to do some intensive writing for a few days..." he begins. 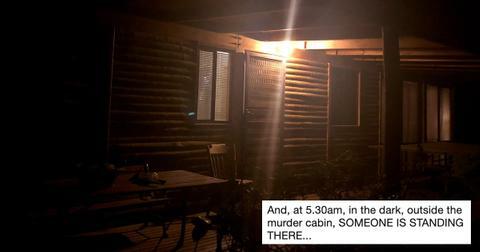 "I’ve been laughing to myself about just how cliched-horror-movie this cabin is. But at 5:30 a.m., out of nowhere, despite it blowing a gale out there for hours, wind chimes start chiming for the first time from the porch..."
I mean, look at that place! Why would you rent this house unless you actively want to be murdered? It looks like it's haunted by at least three dozen promiscuous teenagers. It makes the cabin from Cabin in the Woods look quaint. 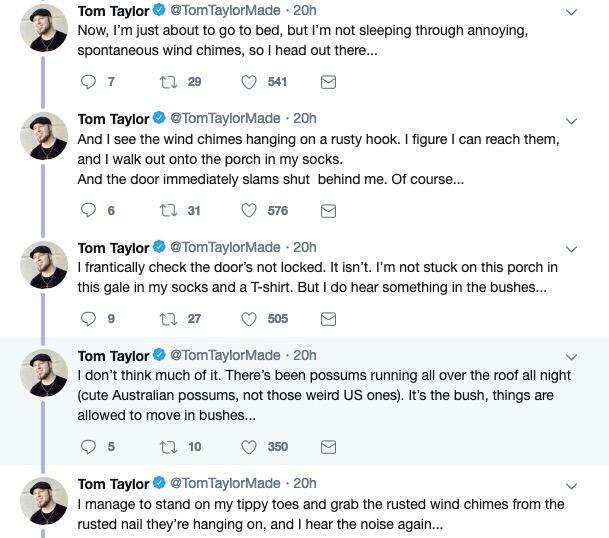 The first scares come when Tom goes outside to remove the wind chimes so the eerie noise can't creep him out anymore. The trouble is, when you're out in the wilderness with minimal light pollution and lots of wildlife, there's always going to be a scary noise you can't explain. 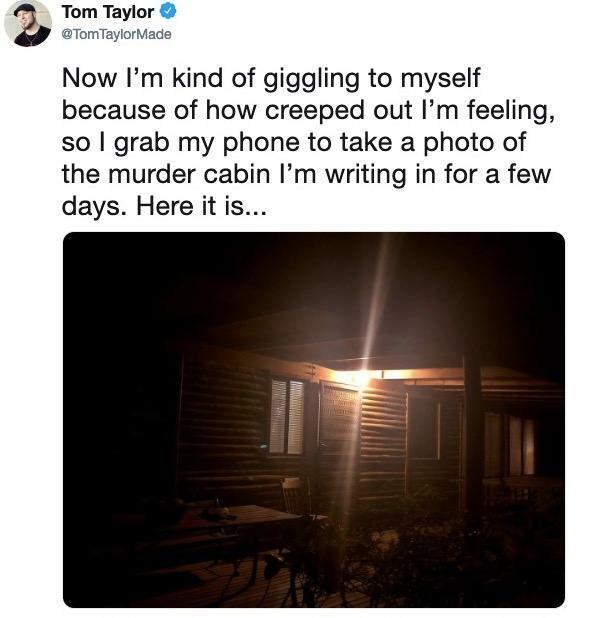 Tom tries to calm himself down, but after taking a photo of the cabin to show his followers exactly how creepy it is, he starts seeing a flashing light, and it isn't from his phone. He's not alone. He tries unsuccessfully to convince himself he's seeing things, or that he flashed himself in the face with the camera's flash, but no, that source of light is definitely in the distance. 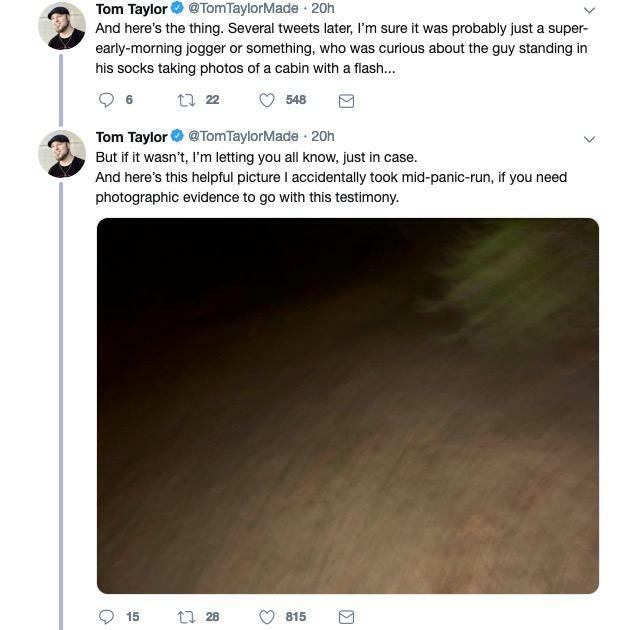 Don't lie — you would've done exactly what Tom did — run for your life. It's better to look like a ridiculous scaredy cat than end up a gruesome scene for some poor jogger to discover the next morning. The bedroom door shuts on its own, which one might explain away by an open window somewhere in the cabin. But then the knob falls off the door. 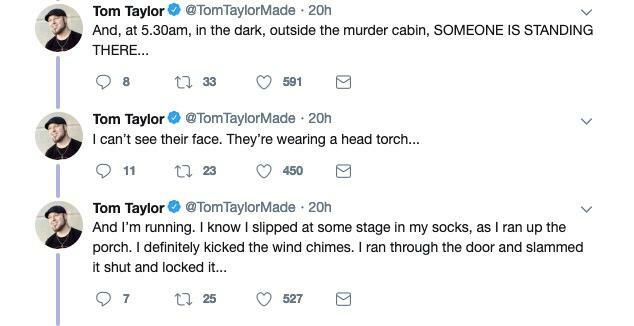 And then Tom goes dark for eight hours, leaving his followers worried that the Blair Witch or Babadook or whatever had won. 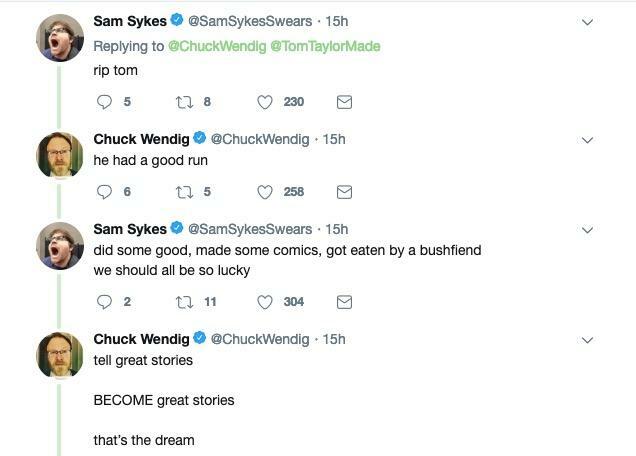 "Tom did you die" tweeted Chuck Wendig. Thankfully, Tom emerges, unscathed, eight hours later. 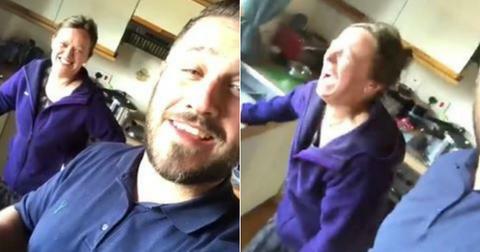 "The story didn’t end there, but my phone battery did, and the charger was in my car OUTSIDE — so, you know, physically impossible to retrieve," he explains. Eventually he falls asleep, despite currying noises on the roof overhead. Then he awakens hours later to a banging at the door. Good news: it's just a package carrier making a delivery. "After the night I’ve had l, there’s no way I’m opening the door to a stranger delivering a package to a remote cabin," he explains. 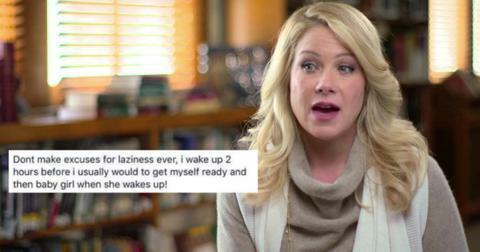 "Also, I’m in my underwear. Also, I can’t open the door because I frantically locked it during the night and I have no idea what I’ve done with the keys..."
That's all well and good, until you find THE CALLS ARE COMING FROM INSIDE THE HOUSE. It's only a matter of time before that's where this goes, right? Anyway, after refusing to open the door to sign for the package he did not send for, the carrier leaves it outside. And, no, he didn't open it to find out. "Why the hell would I open it? You think I’m going to bring it INSIDE?? No. It stays outside. With the wind chimes," he declares. Smart, don't you think? 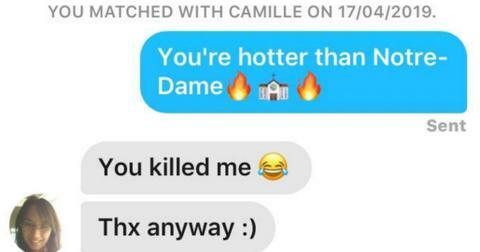 Well, think again. He brought it inside. And though he placed it in the fire cage for safe-keeping, a few eagle-eyed followers spied what looks like a face in the fireplace window. Fun. "There is NOTHING in the fireplace, people," he insists. "I’m here for four more nights. Don’t do this to me." He later admits he can see what folks saw in the first pic of the fireplace — what looks like a teddy bear. 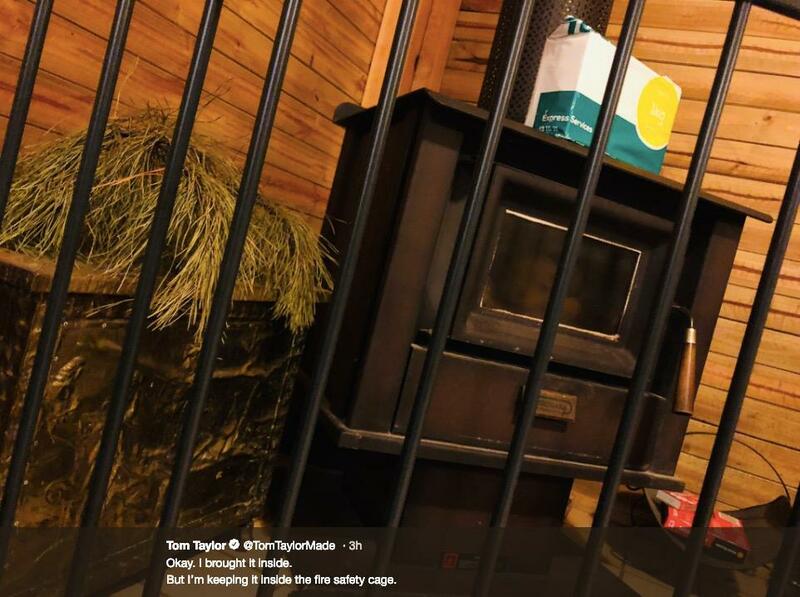 "It looks cuddly, so I'm not worried," he says, though now people are pointing out that in the photo of the cabin it looks like someone is peering out the blinds. "YOU ARE NOT HELPING." he says to the followers making him feel even more unsettled than he did already. But here's where I think Tom decides to have a little fun with us and himself. 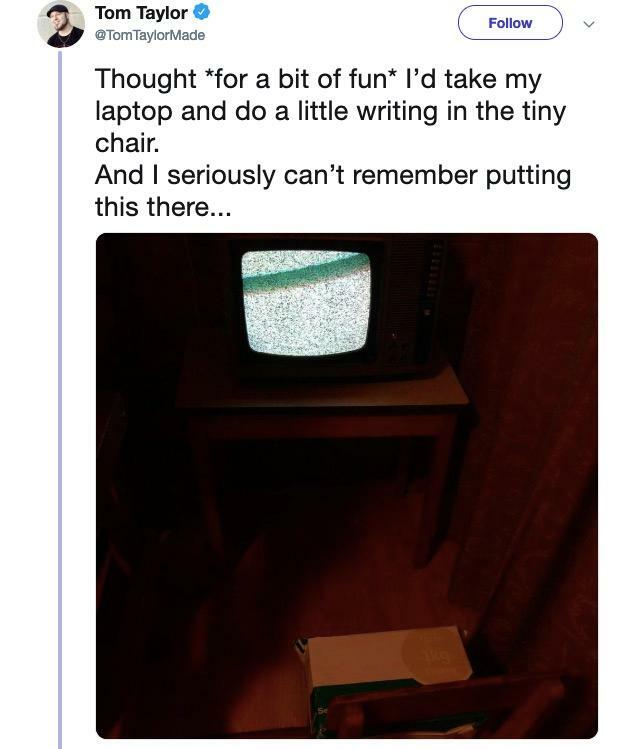 He starts exploring the cabin and finds a room with a television and a tiny chair. Now he's giving us The Ring realness. And then the package "mysteriously' moves from the fire cage to the tiny chair. 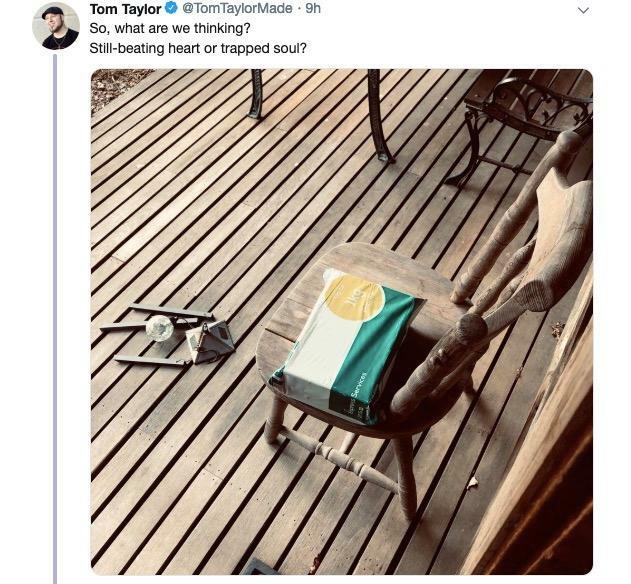 Call me skeptical, but I think Tom's having a little fun over it now. He's been quiet for an hour, so either the writer's block lifted or he's been eaten by the Babadook... I'd put the odds at 50-50.